The new Ford Ranger and Mazda BT50 engines have several common problems. We have tested several EGR coolers that have failed, which can result in filling the exhaust up with water, creating lack of water in the radiator resulting in a blown head gasket or engine failure. We can pressure test your EGR cooler to ensure it has not failed. Our pressure tester simulates working conditions. We carry out two tests, the first test we pump cold fluorescent coolant threw the EGR assembly and increase pressure to around 18 PSI which is above normal operating pressure and hold it for at least 15 minutes, while using a fluorescent light and check for leaks. Our second test we increase the coolant temperature to around 90 degrees while under 18 PSI of pressure to simulate operating temperatures. Sometimes the EGR cooler assembles can leak only on the cold test, and other times on the hot test. While we still recommend replacing your EGR assembly even if the test passes. The testing procedure can only let you know if you have a current fault, it can not predict a failure down the track. Due to these EGR assemblies are common to fail the cost involved to replace out ways a severe engine failure due to a failed assembly. Why would you recommend to test the cooler if you are going to replace it anyway ? If you are trying to find your water, coolant loss you need to know where the problem lies. It is no good just to replace your EGR cooler assembly without knowing if that’s what caused your overheating or loss of water issues. 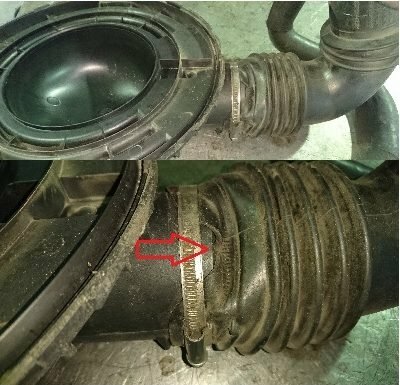 If we test your EGR cooler assembly and find no current faults, we then can let you know your water loss is due to another cause, which we would need to investigate. Water loss can be from a number of areas, It can be as simple as a leaking coolant hose, leaking radiator, or more severe issues such as a blown head gasket or cracked cylinder block etc etc. Head gasket failures can be caused by several factors, A faulty EGR cooler, Blocked or leaking radiator, leaking or burst cooling hose, sticky or failed thermostat etc. etc. Usually the vehicles we replace head gaskets on are from poor or incorrect maintenance. We recommend a full inspection of your cooling system on regular service intervals. UMR Engines at Slacks Creek – Brisbane has all the machines to carry out your repairs to your cylinder head. We employ both engine reconditioners and mechanics with the experience to repair your Ford Ranger or Mazda BT50. 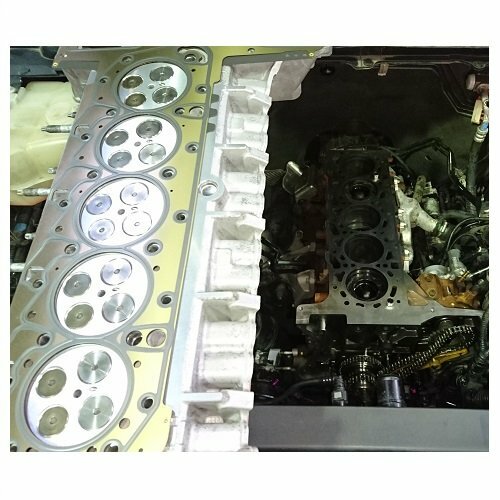 Our cylinder head machine shop can repair or recondition your cylinder head using the latest equipment and technical methods to ensure quality and reliable repairs. This short video shows worn out exhaust valve guides, This vehicle only traveled around 57,000 km. We replaced the valve guides, carried out a full valve service and surface grind to rectify the problem. 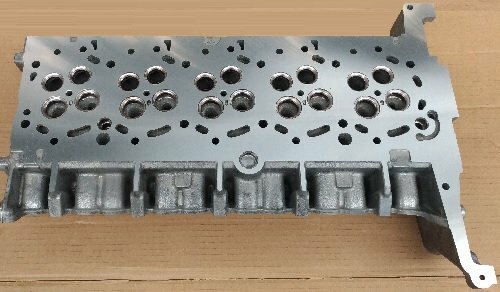 We can fully recondition your cylinder head. 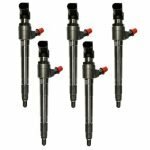 A basic head recondition includes, hardness test, check cylinder head for bend, straighten if required, full dismantle and ultra sonic clean, pressure test, Replace valve guides and valves if required. carry out a full valve grind and surface grind, final wash and reassemble. Holes in pistons are generally created by failing injectors, When these injectors fail they can result in a cutter torch like action blowing a hole in the top of the piston. We recommend to recondition or replace your injectors at 100,000km. We suggest when the injectors are removed to recut your injector seat to ensure a perfect seal. Compression can leak past the injector copper washer if the seat service is damaged or warped. Our qualified diesel mechanics can service, test or replace your diesel injectors, We always recommend to replace your fuel filter at the same time, and to replace your washers. Our trained diesel mechanics can diagnose diesel problems, using latest diagnostic scan equipment, UMR Engines is the place for all your diesel repairs and maintenance. Engine failure after service, can be caused from while draining the engine oil, if you take over 10 minutes to replace the engine oil you run the risk of the oil pump draining back, which can result in the oil pump not to re-prime. Ensure your drain time is less than 10 minutes to prevent engine failure. Is your vehicle lacking power or boost ?